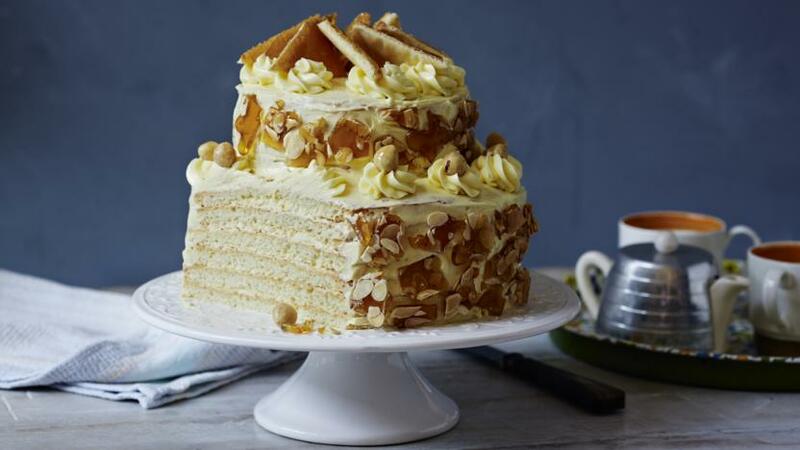 Mary’s twist on this Hungarian cake has a full twelve layers in two tiers and is covered in caramel buttercream. Equipment and preparation: You will need a piping bag fitted with a medium size star nozzle. For the caramel buttercream, place the sugar and 100ml/3½fl oz water into a large saucepan. Slowly bring to the boil over a medium heat, stirring until the sugar has dissolved. Once there is no grittiness left, turn up the heat and boil until a golden caramel. Take off the heat and add the double cream and give it a quick stir then leave to cool then chill until set. Place the softened butter in the bowl of a free-standing mixer and whisk until light and fluffy. Add to the cooled caramel mixture a spoonful at a time, whisking between each addition. Scrape down the bowl regularly. Chill until ready to use. Preheat the oven to 200C/180C(fan)/Gas 6. Mark six 20cm/8in circles and six 15cm/6in circles on baking parchment and lay on baking trays. To make the sponge layers, break the eggs into a large bowl and add the sugar. Whisk with a hand-held electric mixer until the mixture is light and foamy and the whisk just leaves a trail when lifted out of the mixture. Lightly fold in the flour, a little at a time. Divide the mixture between the 12 marked circles, spreading the mixture out evenly. Bake the cakes, a couple at a time, in the pre-heated oven for about 8-10 minutes until pale golden and springy to the touch. With a sharp knife, trim the circles. Peel off the parchment and leave to cool on a wire rack. To make the almond praline and caramel coated hazelnuts, spread the flaked almonds over a sheet of baking parchment on a baking tray. Stick cocktail sticks into each of the 16 hazelnuts. Dissolve the sugar in 8 tbsp water over a low heat, stirring constantly, then increase the heat and boil the syrup until it turns a deep golden-brown colour. Allow it to cool slightly then pour half of it over the flaked almonds. Set aside to cool completely. Dip the hazelnuts in the hot caramel twisting the cocktail sticks so the nuts are completely coated in caramel. Carefully invert the cocktail sticks and press them into an orange or piece of foam and leave to set. 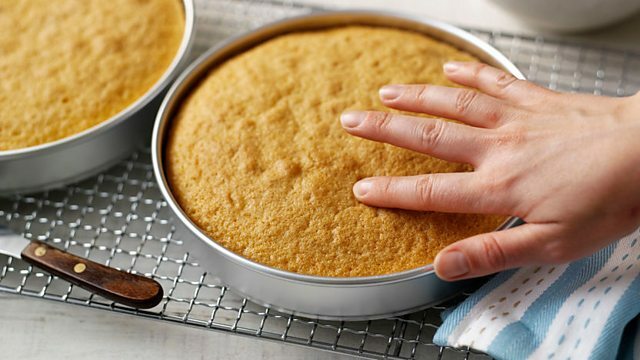 Take one of the 15cm/6in sponge circles and place it on a sheet of silicon or baking parchment. Pour the remaining caramel over the sponge circle. When the caramel on top of the sponge is just beginning to set, mark and then cut into eight portions with an oiled knife. Sandwich the six circles of 20cm/8in sponges together with caramel buttercream. 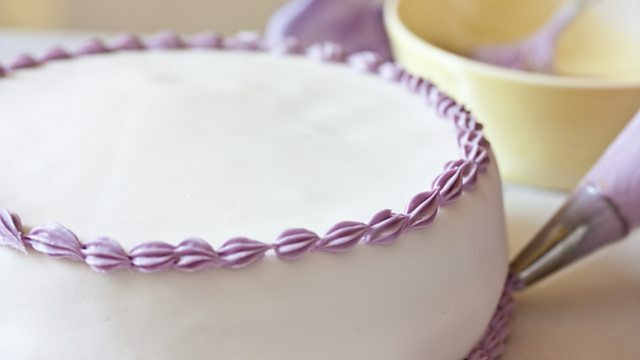 Spread the sides and top with buttercream. Sandwich the remaining five circles of 15cm/6in sponges together with butter cream. 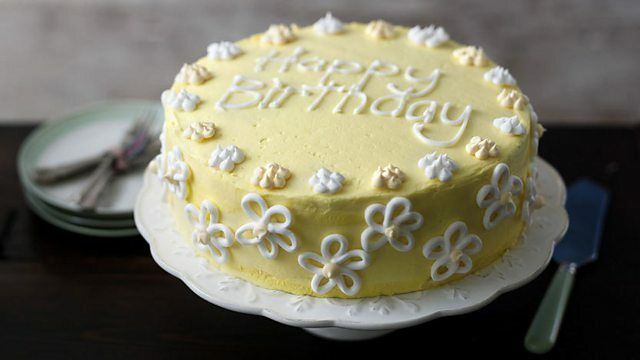 Spread buttercream around the sides and top of the cakes and place on top the 20cm/8in cake stack to form a second tier. Spoon the remaining buttercream into a piping bag fitted with a medium size star nozzle. Pipe 16 rosettes of the buttercream around the top edge of the larger cake and top each rosette with a caramel coated hazelnut. Pipe eight rosettes around the top of the small cake and place a caramel-topped wedge of cake at an angle on top of each rosette to form the top layer.